Stainless steel, with its exquisite colour reflections, has always featured attractively on Glem products, brightening up the kitchens where they are installed. Resistant and stylish, stainless steel is one of the most widely used materials in our cookers and so it is very important to know how to take care of these surfaces. Following just a few practical rules will ensure that stainless steel keeps all its shine and strength intact, as bright as on the very first day. 1. Avoid salty solutions drying or remaining on the surface, because they can cause corrosion phenomena. 2. Avoid prolonged contact with ferrous material (steel wool, carving forks, ladles, scrapers, etc.) to avoid triggering corrosion, from contamination of the ferrous particles in circulation. 3. 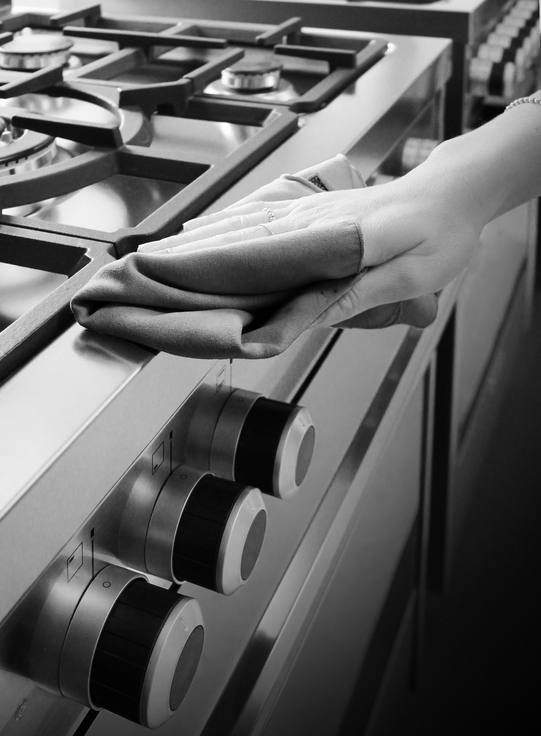 Carefully clean the stainless steel surfaces using a damp cloth (e.g. microfibre), water and soap and common, non-abrasive and chlorine-free detergents. 4. Wipe in the satin direction, if satin-finished. 5. Rinse well and dry carefully. Use a multi-purpose detergent cream with a damp cloth (e.g. microfibre). You can also use white vinegar, possibly hot, rubbing with a soft cloth (e.g. microfibre) and then rinsing well and drying. Use mild washing-up liquid or a mild detergent in very hot water. Rinse with plenty of clean water and dry with a soft cloth (e.g. microfibre). For more stubborn stains use ethyl alcohol or white vinegar. Use a mild detergent or washing-up liquid in water or, alternatively, delicately wipe with a soft cloth (e.g. microfibre) and window cleaner. Use a soft cloth (e.g. microfibre) with a multi-purpose, cream detergent for household cleaning. Rinse under running water and dry with a soft cloth (e.g. microfibre). Use a soft cloth (e.g. microfibre) with a specific emulsion detergent to clean stainless steel. Remember that food and liquids must be immediately removed from stainless steel surfaces. According to the adhesive substance, the residue can be eliminated with water, alcohol or acetone based solvents which, as known, do not affect stainless steel. surfaces or which can transfer ferrous particles. • Use of aggressive products to clean stainless steel. • Ferrous residue in circulation from extractor hoods placed over the equipment. • Direct contact with or only the vapour from acidic, alkaline or ammonia based products. • Contact with rags, sponges or other similar objects, used to clean other objects or other materials. To remove these stains, apply a cream detergent using a soft, damp cloth (e.g. microfibre) and wipe delicately. Instead, if rust is already present, you need to cover the relevant part again with a lemon and salt mix and leave to act for a few minutes. The rust will quickly detach thanks to the action of the lemon and you can remove it with a soft sponge. The rust that will detach will most likely weaken the metal where slight cavities may have formed. REMEMBER: it is good practice to test any new products for stainless steel cleaning on out of sight parts and wait a few hours to assess the effect.